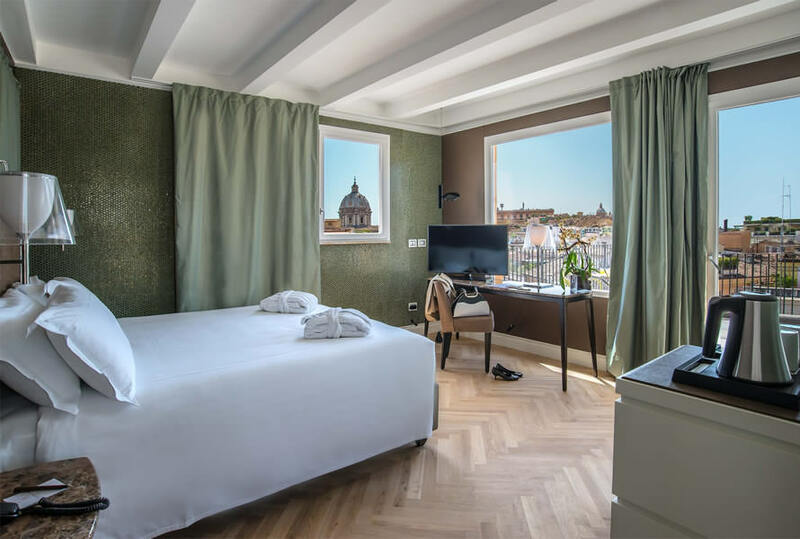 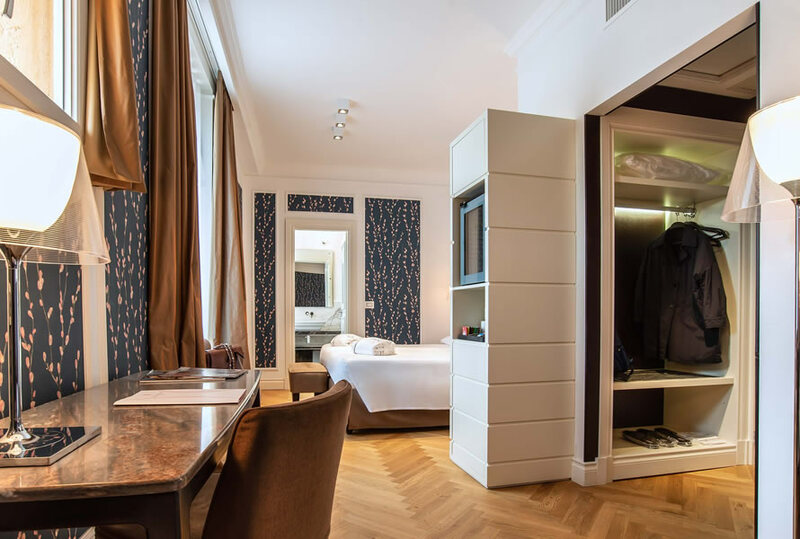 The 3 Star Damaso Hotel Rome by Campo de' Fiori has elegant and sophisticated 39 rooms allowing us to give each and every guest our personal attention. 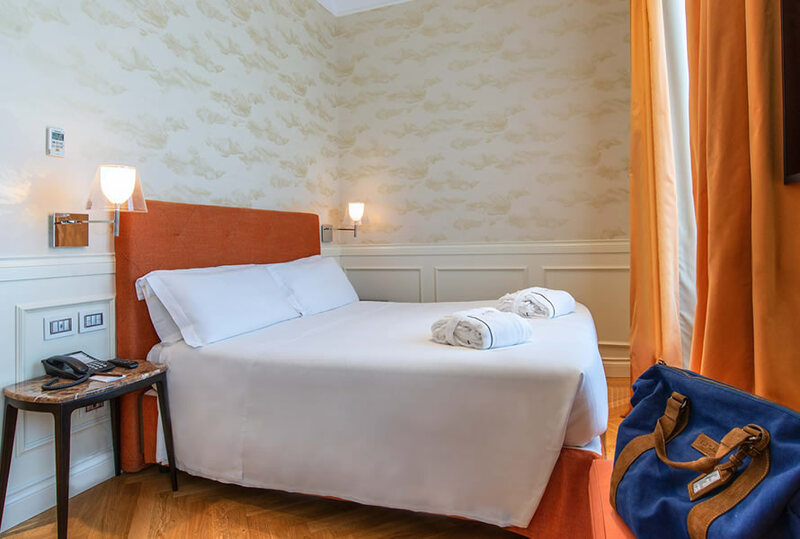 39 of our rooms are double or twin, some have private terrace and space for extra child beds. 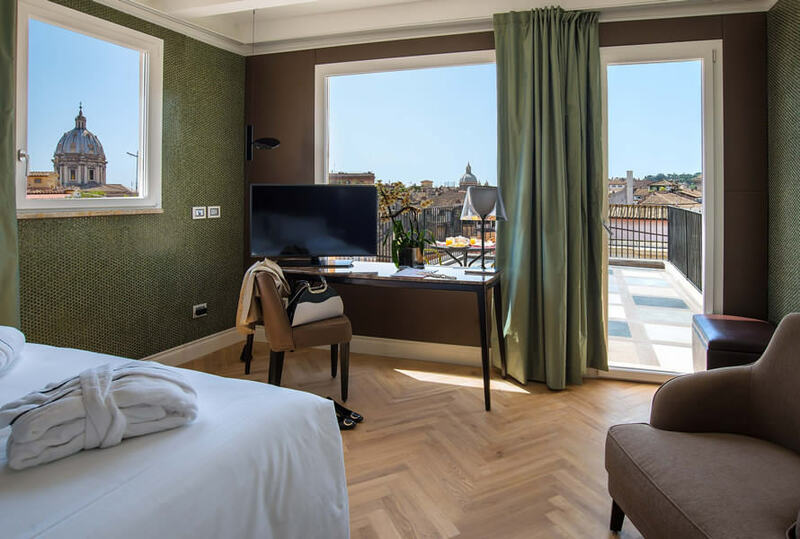 The Junior Suite and Penthouse Room, both with private terrace will ensure you an unforgettable view of the Eternal City. 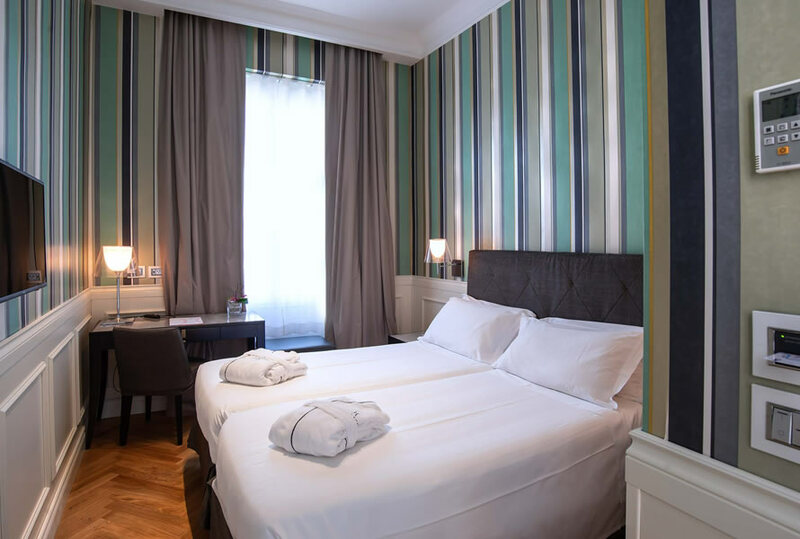 Classic double rooms are approximately 14 square meters. 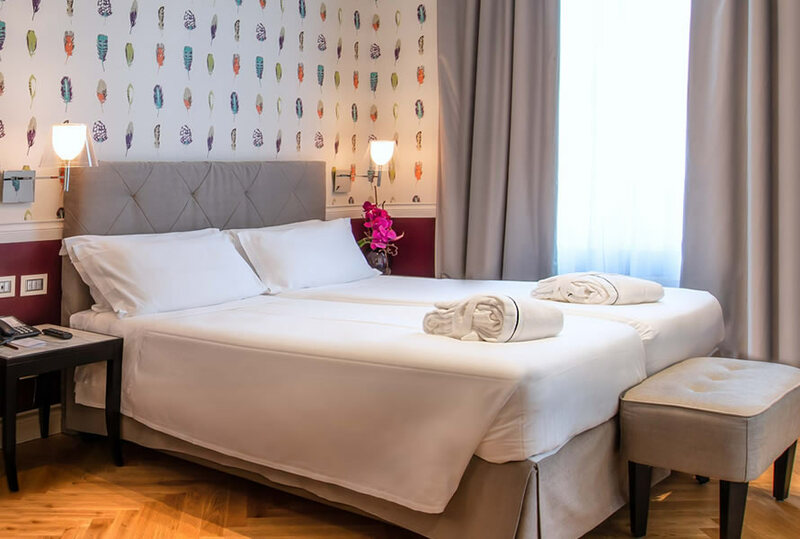 Nicely decorated in a contemporary classical style, these elegant and quiet rooms have a queen or twin bed and are enriched with modern marble bathrooms. 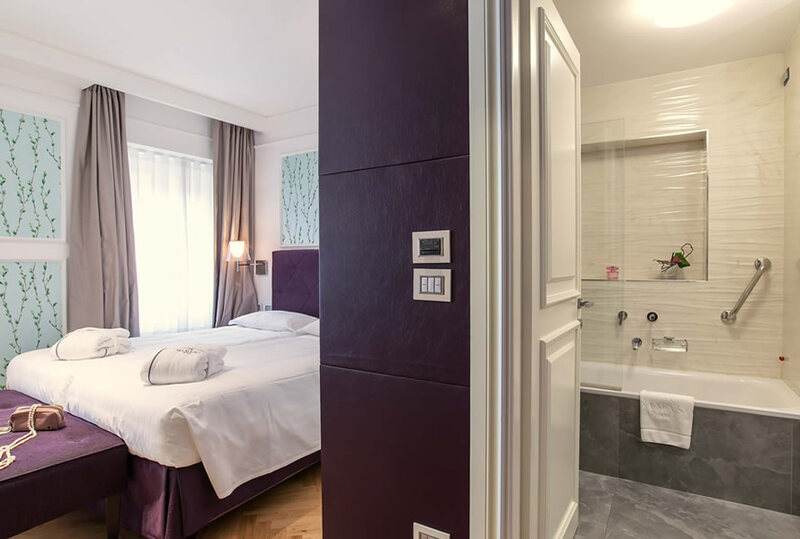 Triple rooms are approximately 21 square meters. 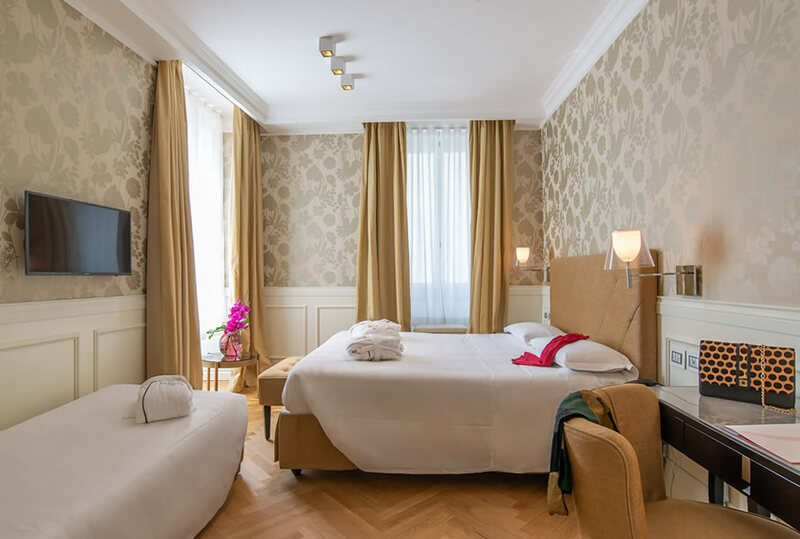 Nicely decorated in contemporary classical style, these elegant and quiet rooms have a queen or twin bed and are enriched with modern marble bathrooms. 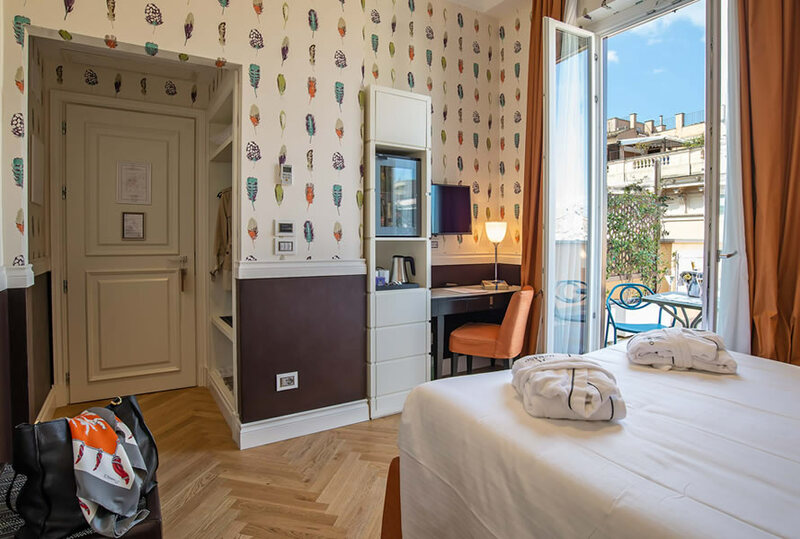 Triple rooms with separated beds are approximately 21 square meters. 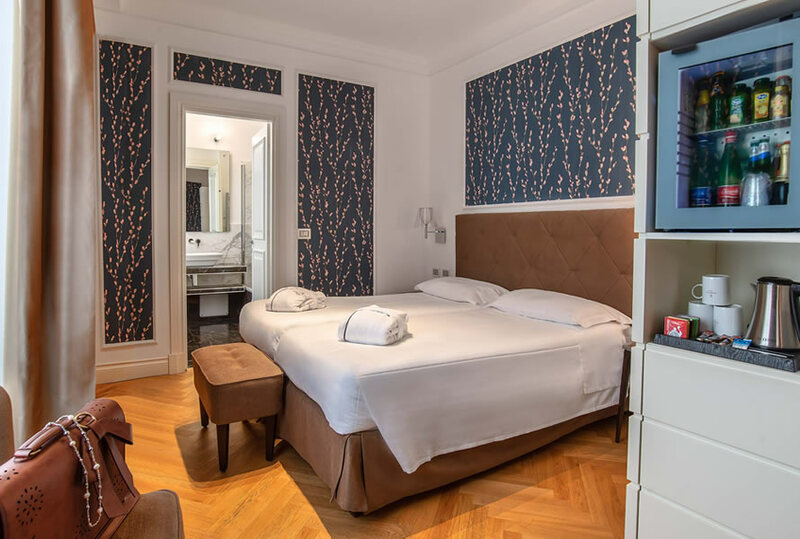 Nicely decorated in contemporary classical style, these elegant and quiet rooms have a queen or twin bed and are enriched with modern marble bathrooms. 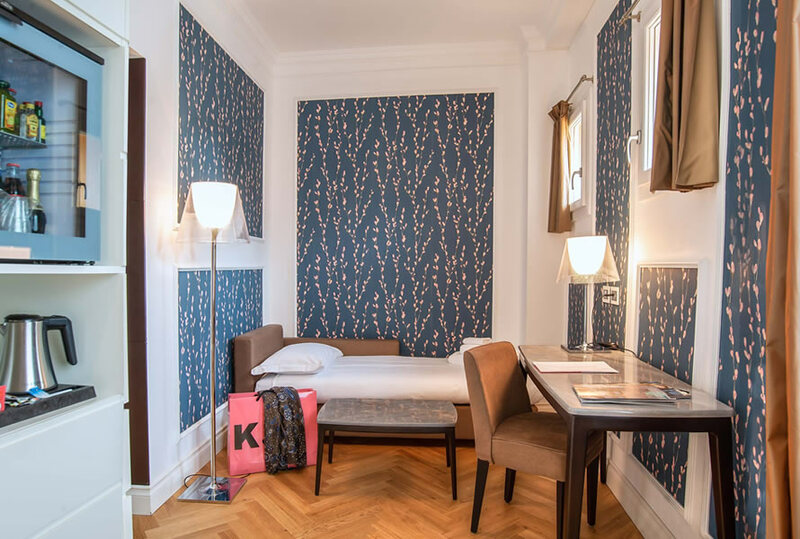 Superior double rooms are approximately 17 square meters. 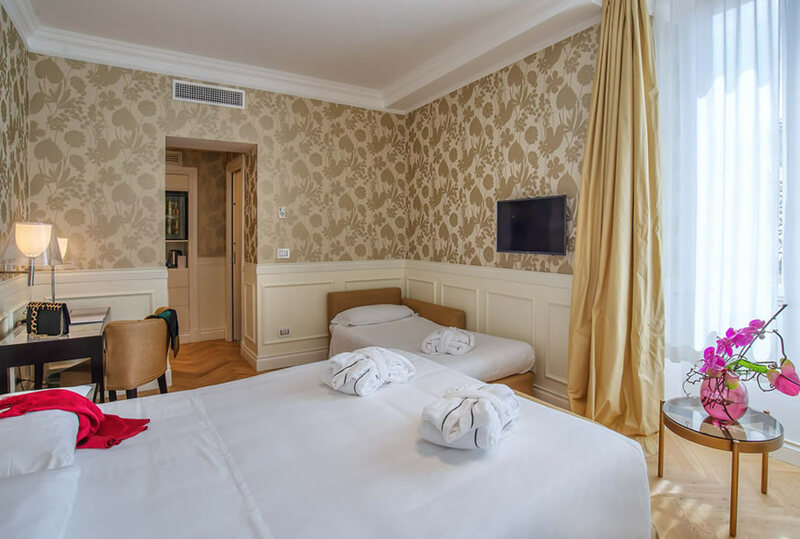 Nicely decorated in contemporary classical style, these elegant and quiet rooms have a queen or twin bed and are enriched with modern marble bathrooms. 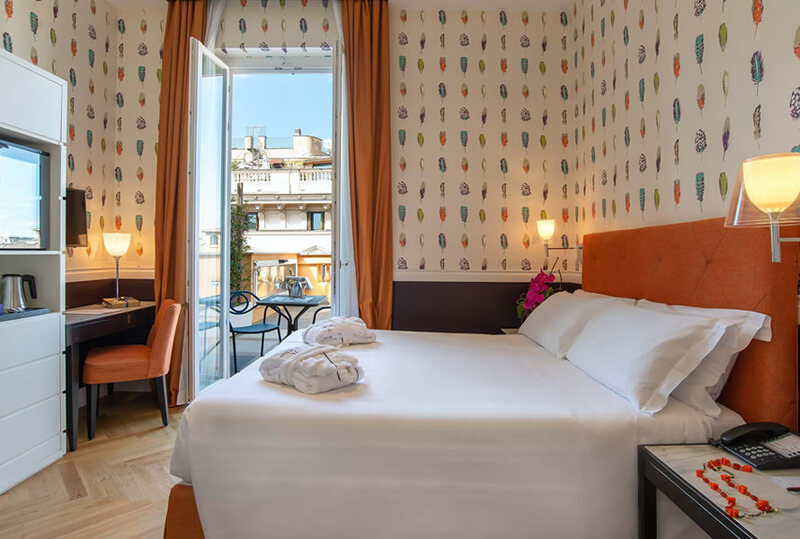 Deluxe double rooms are about 14 square meters and have a private terrace with spectacular views over the rooftops of Rome. 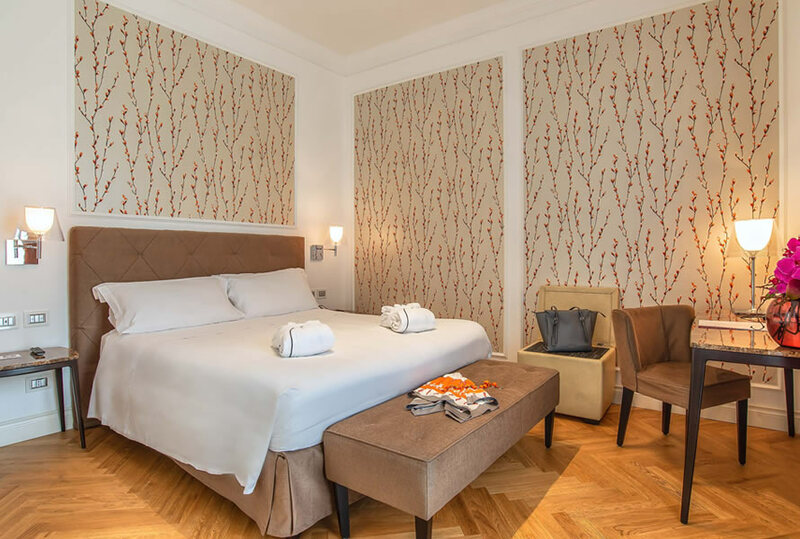 Nicely decorated in contemporary classical style, these elegant and quiet rooms have a queen or twin bed and are enriched with modern marble bathrooms. 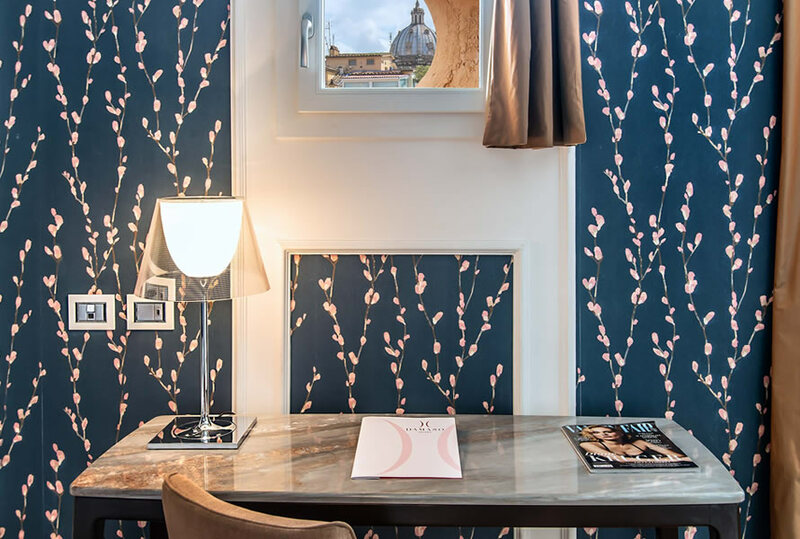 Junior Suite are approximately 27 square meters plus a private terrace with spectacular views over the rooftops of Rome. 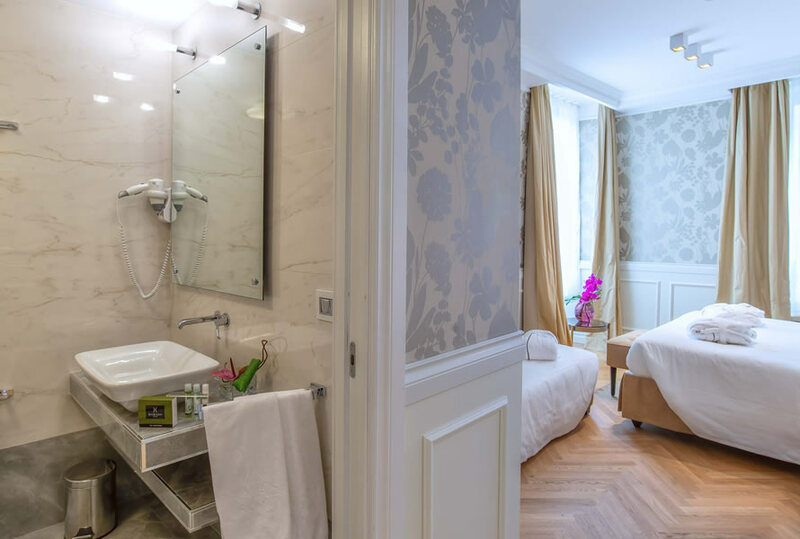 Nicely decorated in contemporary classical style, this elegant and quiet room has a queen or twin bed and is enriched with a marble bathroom with a modern design. 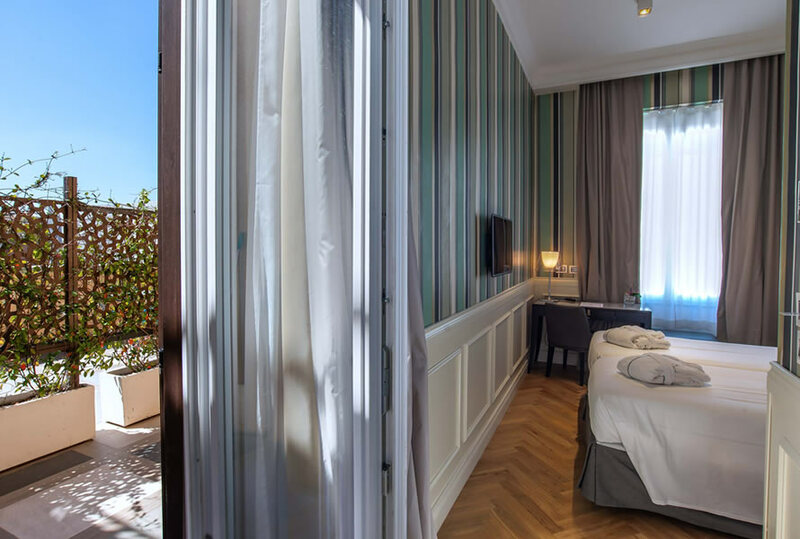 The Penthouse Panoramic Room is located on the top floor of the hotel and has an internal surface of approximately 27 square meters. 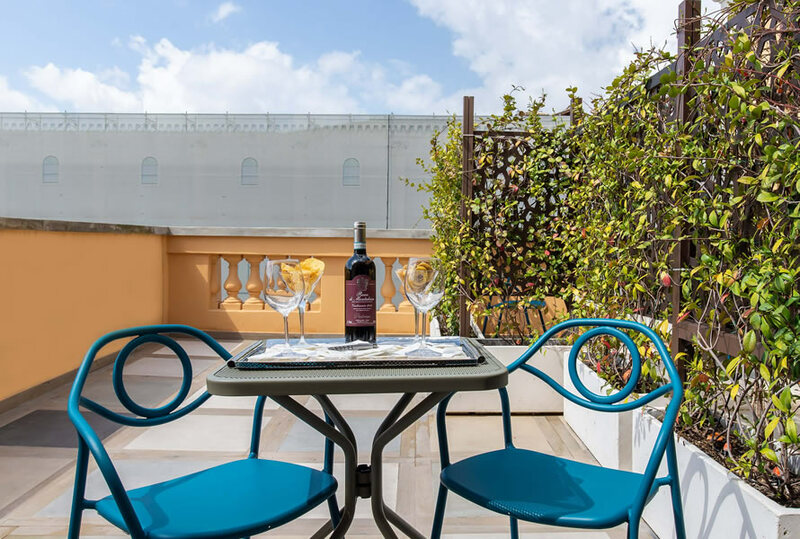 It features a private terrace with breathtaking panoramic views of the Eternal City rooftops. 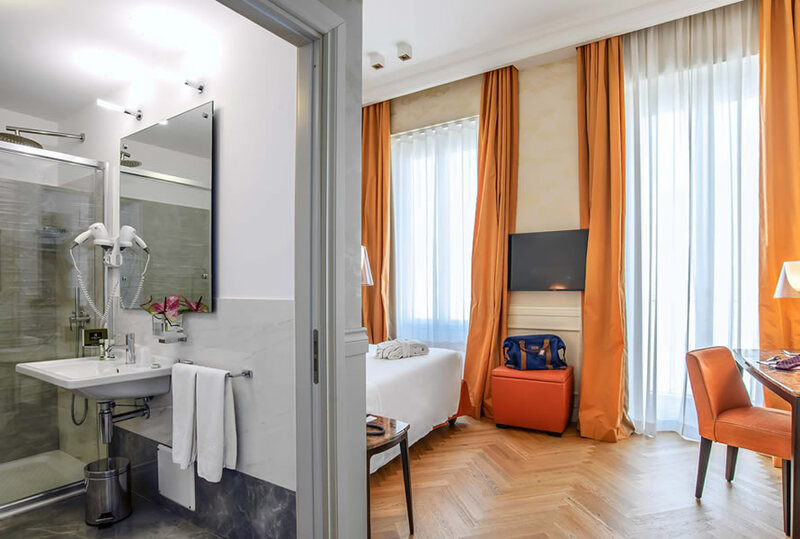 Nicely decorated in contemporary classical style, this elegant and quiet room has a queen or twin bed and is enriched with a marble bathroom with a modern design. 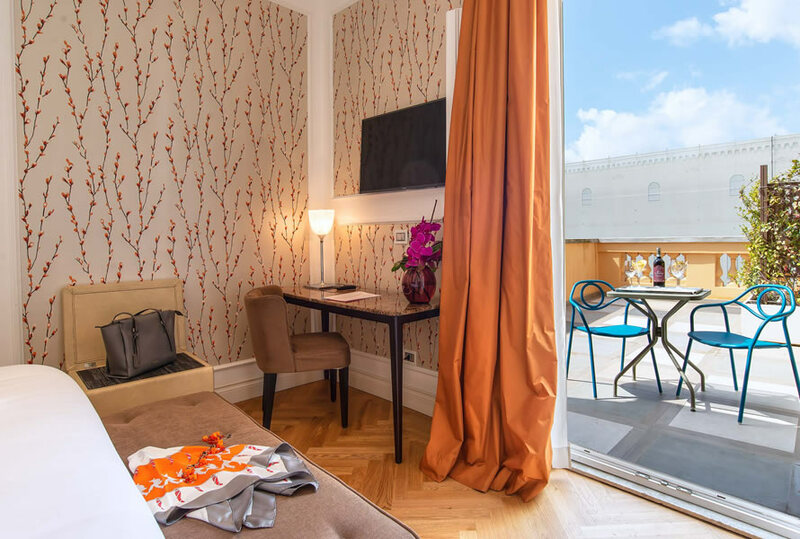 The 20 sqm terrace is furnished with sofas, teak tables, chaise lounges, Mediterranean plants and flowers and is the perfect space to accommodate small lunches or private dinners. 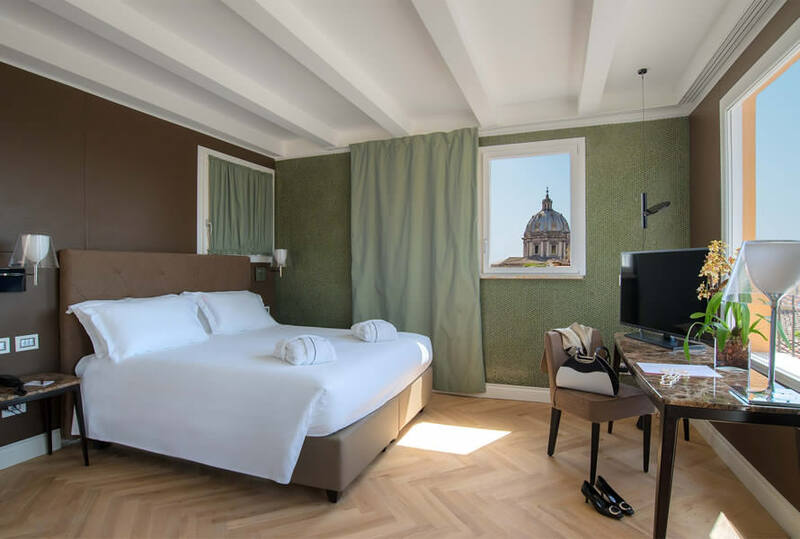 A day spent strolling through the immortal streets of Rome is an incredible way to spend the day, but at the same time, it can be a tiring experience. 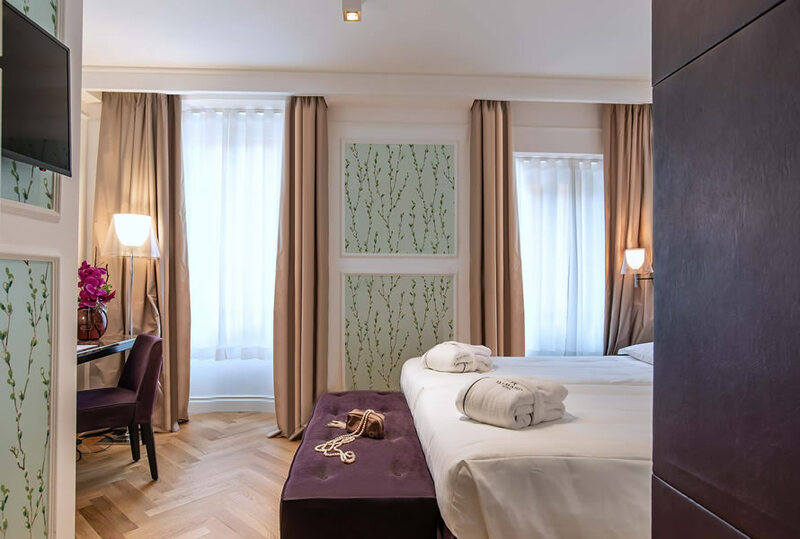 That is why Hotel Damaso has provided a Lounge Bar for its guest, the perfect place to relax and recover from a long day. 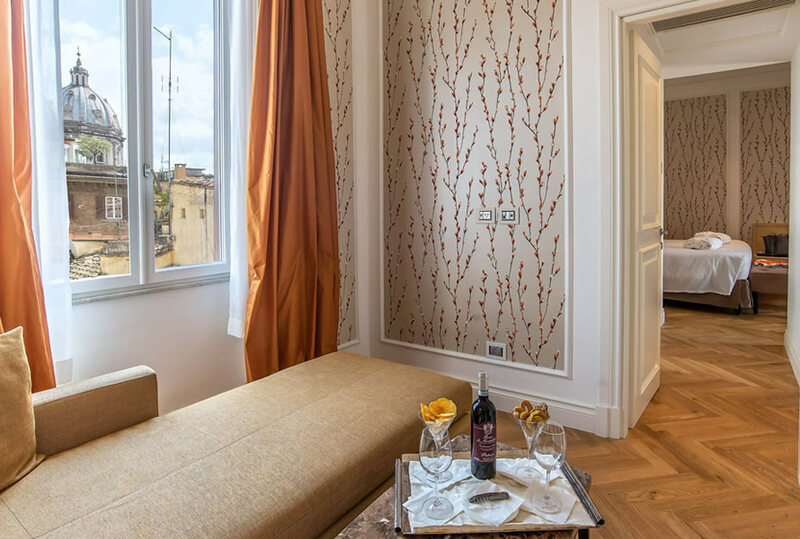 Designed as a private lounge area, Hotel Damaso's bar is the perfect place to have a drink prepared by our bartender or enjoy an aperitif in full relaxation. 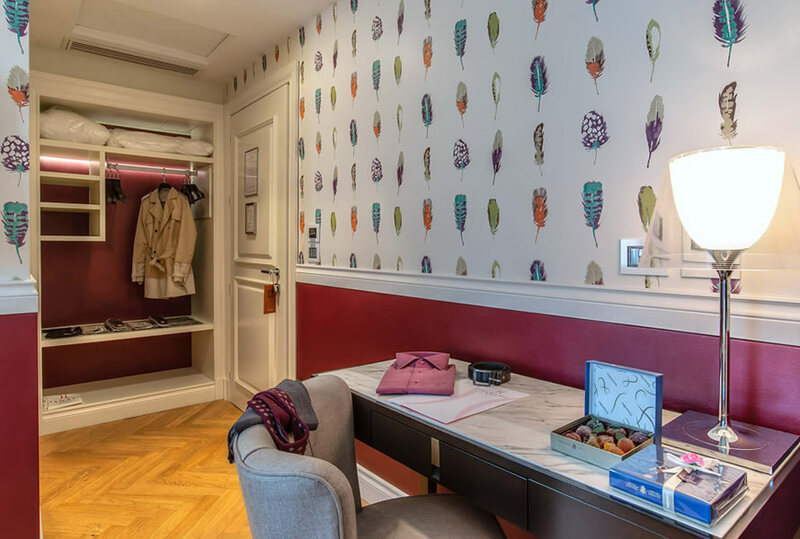 Opening hours: 17:00-23:00. 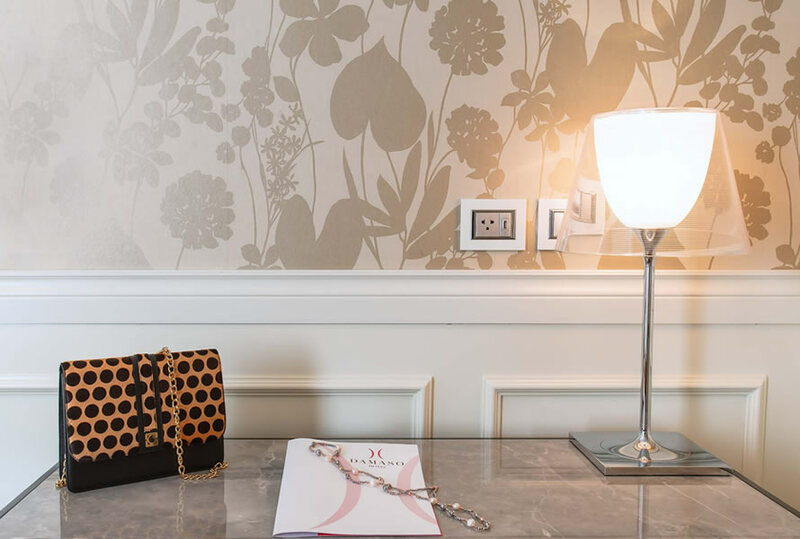 Our Living Room is ideal for reading a newspaper or book, winding down after a busy day. 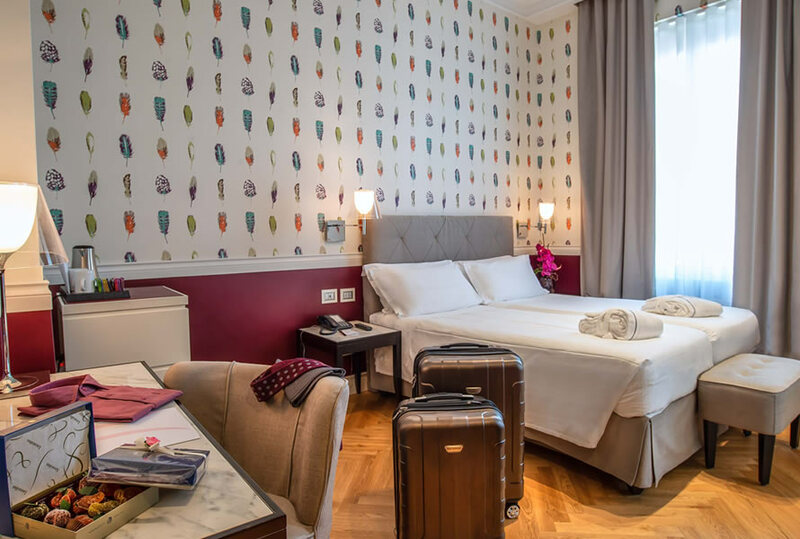 Decorated in contemporary classic style, it features a library and an Internet Point. 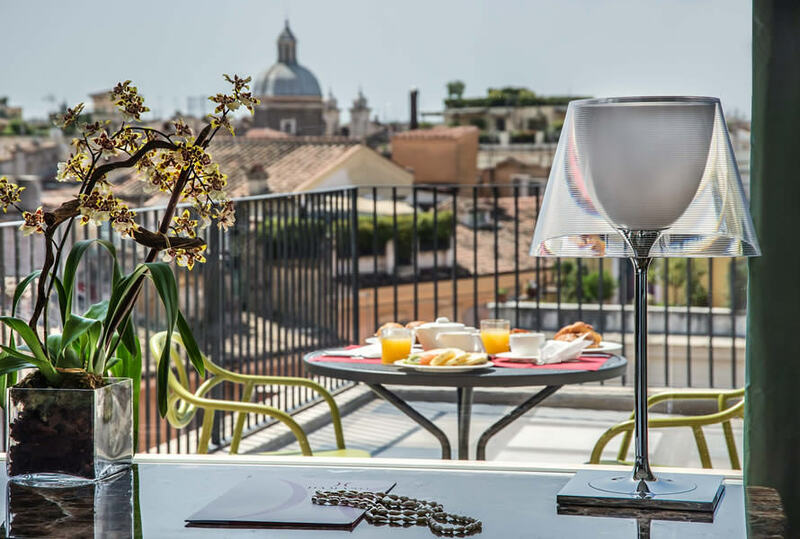 Hotel Damaso is embellished with a beautiful panoramic terrace offering a unique view of Rome's main monuments and the "Eternal City" roofs.